Your reaction to those thoughtless and rude comments was perfect. Did the complainer offer their credentials to prove how much better they are than you in making such decisions as your name and wardrobe choices? In the US the expression ‘Broads’ or ‘Dames’ was used at that time, so its not seen as a derogatory statement when put in to the context of your historical musing. Skirt length is personal and in the right settings its seen as the norm, however we tend to see a move to jeans and trousers nowadays in the UK so anyone in a skirt or dress seems to be in the minority, unless working. Being an adolescent of the 60s and attending a college located on the Kings Road, I can vouch that although it may no longer be PC, ‘birds’ was the word used by everyone under 25. Seem to recall dolly birds being used as well. Stana, I find it astonishing that social media has so quickly broken down the common courtesy that has allowed the human species to survive and grow for the last 10000 or so years. Keep on keeping on, Stana! I hope you are right, Lori, but trolls just keep on trolling. Stana, there's nothing wrong with the way you dress. If you've got it flaunt it! Your "fan" is obviously stuck in old-fashioned ideas of what is appropriate for mature women. You are right to ignore her complaints. My only complaint is that we don't get enough photos of you and your lovely outfits on the blog! Thank you for the kind words, Dani! The way you tag posts on this blog makes the tags completely useless. I plan to do better in the future. Well, I guess that person wasn't really your fan at all. He/She didn't like anything! I like you whether we call you Sandy or Stana or Stan. I think we should always take a good hard look at ourselves in the mirror and be honest, "does it look good? does it make me feel good?" then wear it or not depending on your thoughts. Christy Brinkley is so beautiful at 63? but of course she always was beautiful. I think you look great in short skirts (great legs) wear them and be as wonderful as you are. I wonder why anyone would think that her opinion should rule over your blog? It is your blog not hers/his and if he/she wants to make the rules, make your own blog. "You can fool (please) all of the people some of the time and fool (please) some of the people all of the time, but you cannot fool(please) all of the people all of the time." To stick with Lincoln quotes he also said "Whatever you are, be a good one." And each to his/her own! It's amazing how someone would complain about your blog - especially when it seems that the person doesn't blog him/herself. First, I don't care what name you use. 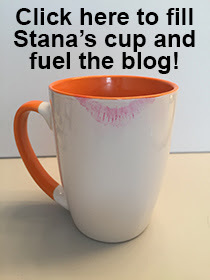 You've discussed names before, and long time readers will know why you chose Stana as your blogger name. Next, I know many cicgender women who will show "a little too much leg" at your age. As they say, "If you've got it, flaunt it!" I wish I looked as good as you do. So don't worry about that comment. And then, the way you write brings in a lot of readers from what I can tell. So don't change a thing. I have my own criticisms about your blog, but they are stylistic or minor ones with content. So I keep them to myself, because each blog to be effective, should reflect the style of the writer and not one or two unknown readers. Yours does. BTW - Does being 5'14" (as you once put it) affect your skirt length? WHISKEY, TANGO, FOXTROT? Your blog is just great! There are those who critique, and those who PRODUCE. And you constantly produce a great blog. Stana,you got great legs so show 'em. If I could not show my legs 'en-femme', then why bother? My legs are also 64 y-o, and they look great after 36 years of climbing in/out of 'Cab-over' Tractor-trailers! Thank you and QUEBEC SUGAR LIMA, Velma. So... she's reading why? And she's been reading a long time, if she remembers "Sandy"
As for your name, your co-workers named you Sandy; your parents (more-or-less) named you Stana. They trump. Love your comment that my parents named me Stana, more or less! Thank you, Meg. Just to add to the chorus: goodness me! Why would anyone have those complaints? On your NAME? For goodness' sake, it's your name! Stana is a perfectly acceptable name as it is YOUR name. And then to presume to call you by another? I can't get past that. I just... I struggle to understand why anyone would deliberately choose to do that. Speaking as a significantly younger femulator with significantly less experience than, well, most of your followers and your good self - you rock the mini-skirt or mini-dress look. Hell, you look fantastic in all of the photos you have shared on this blog. I do not understand the "as a feminist" part at all. Maybe they are, maybe they aren't; but it has no bearing on any of what they said. As a complaint: you are inspirational. Yes, that's as complain-y as I can get (see the less derivative CallMeMeg further up). Agh, that's all I have to say. Keep on keepin' on! Enough, you are fantastic, I felt moved to comment, I am not alone in so doing. Thank you for the very kind words, Joanna. I will try to be less inspirational (LOL). Whether "bird" is good or bad today, I was using it in its historic context and it boggle my mind that anyone would be offended by it's use, feminist or not! If I could muster a complaint, it would be more content! I would check in more times each day if there was more content added to your personal blog. With that said, I am content knowing that almost every morning I have some great and inspiring information to read, photos to admire or... your great "Someday Funnies." I also know that you have a life, blogging isn't your only activity each day. There are many websites and blogs online, unhappy Fannie doesn't have to visit your blog if it is displeasing to her fashion sense or sense of morality (really criticizing your skirt length??). 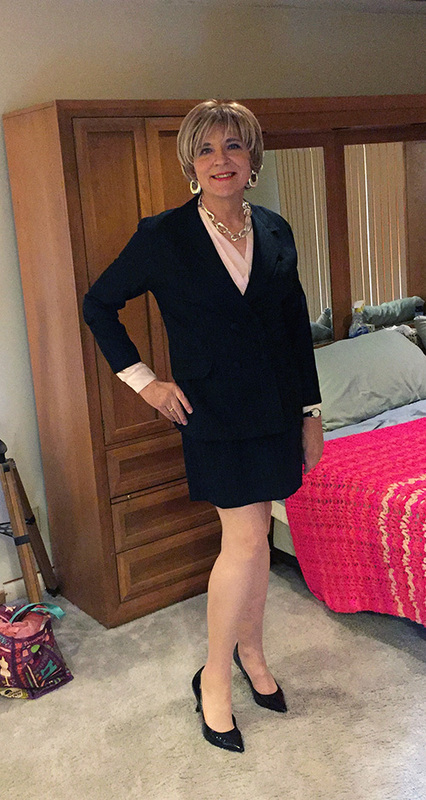 As you say in the sidebar, "My skirt's not too short---my legs are too long." Some days the content just flows without effort and other days, it's like pulling teeth! Not to mention that the pay stinks! So I don't expect I will be able to do much better content-wise. Sorry! I have posted here a few times and you have always been kind enough to permit these replies. I do appreciate that as we have differed a little bit on the political realm. Therefore, I do not understand why the original letter-writer took time from their lives to be so unhelpful and unkind to you. The anonymity of the Internet will be the death of us all. No one would even think about being SO impolite in person, yet many people think it's OK to be so rude when there is no social price to pay. P.S. Stana sounds SO Eastern European and mysterious...I wouldn't even THINK of a change. Thank you, K. Believe it or not, the complainer was not anonymous. And Stana is an Eastern European name, which fits perfectly with my Polish roots. WOW, I have so much to comment on that I could end writing more on this than you did! I suspect that many readers do not understand just how much commitment and emotional energy goes into producing a daily blog. I only occasionally commit to daily entries, and it is hard. So before any sort of criticism should come acknowledgement and thanks. There are areas where I disagree with you, I would not now use the term "Birds" but certainly at the time you were referring to it was in common usage, and the attitude it betrays was current and applicable. I was even thinking of writing a comment on that post pointing put the term is now considered inappropriate and insulting over here, but didn't as I considered the subject matter. However that would have been an observation, not a complaint. In the UK anyone can change their name to anything they like ~ that does mean we do end up with some pretty wacky choices, but most people don't change, we mostly more or less have to, and it is a hard choice, a choice we have to make for ourselves, drawing on our character, our parents choices, and our personal preferences. Like you I choose a very small change (one letter) there are other female forms of my original given name but they didn't seem to fit as well. At one concert I played in I was credited as Pauline and was totally horrified! I like the name Sandy, I have a friend called Sandy, but why would I want to impose my choice on somebody else? When you have a choice your name should reflect as much of you as possible ~ to me Stana seems to work fine for you. I may not make the same wardrobe choices as you, I am not you and I live a different life. I am a similar age and I enjoy wearing minis, I do not live in them as that would not be practical for my lifestyle, how we choose to dress is a reflection of the occasion, our character, our occupation (at the time) our social situation, and our social setting. My father used to observe that the girls with the shortest skirts had the biggest noses, sometimes I wonder if I will wear a short skirt to distract attention from my face! I will finish this little bit by saying that when I do wear a mini, I feel so much power! Waling down the street I know I own that street! I feel confident, I feel in control, and I know that I have peoples attention! All of this seems to me to be about choice, what you choose to do, what you choose to share, how you choose to share it ~ and finally (at last she cries!) my choice to keep reading. As we say over here "More Power to your elbow, keep up the good work"
Thank you for the thoughtful comments, Paula. I guess only another blogger knows what goes into blogging. On a daily basis, I spend 1 to 3 hours dealing with the blog (more often 3 hours, not so much 1 hour) and about once a week, I consider quitting. To your complainer: In context of your post, "birds" was EXACTLY the right term to use. Repeating a comment I made above, "Whether 'bird' is good or bad today, I was using it in its historic context and it boggle my mind that anyone would be offended by it's use, feminist or not!" "Women shall not wear pink above 25 yrs. old." "Women shall not wear short skirts above 40 yrs. old." "Women with size 12+ shall not wear sleeveless shirts." "Men should not wear short pants( opden shoes - except holidays." Okay - everybody might try to look as good as possible. But there should be no more rules of what to wear, because of age, weight, race, gender, family status/ sexual orientation, etc. If some "best agers" (above 60) like to wear mini skirts and stiletto heels - why not?! Especially if they have an adorable sight - show it! Another rule I like to break is "don't wear white after Labor Day."